The woodlands school influence showed on Manitoulin Island in the late 1960's. Inspired by the reception that the woodlands school artists were receiving in mainstream Canada, the Manitou Arts Foundation was started by Tom Peletier in 1966. Tom was an Ojibwe writer from Wikwemikong who was concurrently assisting with the creation of the Indians of Canada Pavillion for Expo '67. 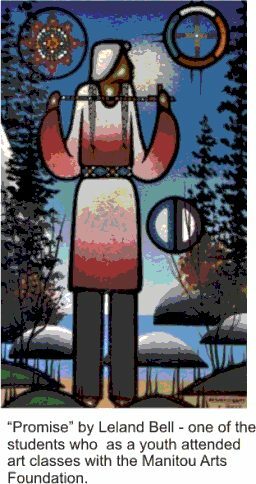 Tom organized a summer school which was held on Schreiber Island, with Daphne Odjig, Carl Ray and Gerald Dokis as resource people. Among the students were Shirley Cheechoo, Randolph Trudeau, Blake Debassige, Leland Bell, and Martin Panamick, who went on to achieve reputations as Indian artists with their own unique visions and styles that still bear certain indications of their origin in Manitoulin's Manitou Arts program. Legends and traditional stories were what most often inspired the young painters, but they were also interested in nature painting, and cultural history. These young artists later found mutual support and a cultural framework through the summer art programs organized by the Ojibwe Cultural Foundation, which continued the arts and culture programs of the shorter-lived Manitou Arts program. 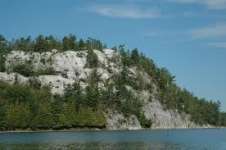 In 1976 and 1977, the summer arts site chosen was Dreamer's Rock on the Birch Island Reserve of Manitoulin. The site had spiritual significance. In the past, young Anishinaabeg had gone there on a vision quest to seek direction in their lives. It was hoped that the choice of site might enhance artistic visions. The meetings indeed strengthened Indian ways and values - as seen in their paintings and drawings that celebrated old ceremonies and new dreams. Unfortunately the area around Dreamer's Rock was heavily vandalized and trashed in 1974 by non-native residents of Manitoulin...perhaps in response to Native activism, both in the U.S. and Canada, concerning Native land, rights and sovereignty. At the time there was a good deal of hatred and "backlash" from many white people about this. The young people, sad and angry at the trashing, cleaned it up and then traditional elders re-consecrated the site. They smudged with sacred cedar and held sweat lodge purification ceremonies - the first time many of the young artists had been exposed to that part of their heritage. The woodlands school influence continues in the artworks of the children and grandchildren of many of the original Indian Group of Seven and their students. In prehistoric times art played a major role in Woodland cultural renaissance during times of extreme stress and art is playing the same role today. Some discussion on the meaning of the symbols used in by woodland artists.